THE REAL QUESTION is not "Why did the chicken cross the road?" The real and burning question is, "How the heck did that chicken survive wandering around the Calftown jungle for two days?" I took the dogs for a snowy run Sunday morning and when we got back, there was the chicken, calmly walking around the alley behind our garage. Sheryl and I walked up to the chicken, who was dining on something disgusting, and she calmly picked it up without a struggle. 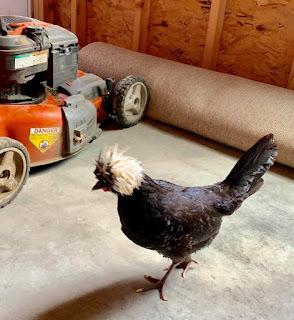 It clucked a few times, and we brought down alley to Mary Dickerman's place. She and Tony have chickens. Mary said, "That's not our chicken. Donna next door asked us a few days ago too." Sheryl thought about calling Animal Control the next morning. I said, "Why not put it on Facebook? Isn't there a lost and found thing for animals?" She agreed. We put the chicken in the garage, got it some food (chickens eat anything, apparently, even our cat food and random seeds), took some pictures and put a post on my Facebook page. Within seconds we were getting responses and page shares. And, about 15 minutes later, the owner contacted us with an emphatic "My baby!" Turns out the chicken lives one block south of us, on the other side of Jefferson. It escaped Friday and somehow avoided the many feral cats, roaming dogs and other creatures of our hood. It even survived a nasty little rain/snowstorm Sunday morning. How did it cross Jefferson street without getting smushed? The owner came over and there was a joyful reunion involving much clucking and hugging of a chicken. It's home safe and sound, and everything is back to normal in the Calftown hood. Whatever normal means. Cluck cluck cluck! Labels: chickens, Facebook, feral cats, stray dogs, Why did the chicken cross the road?